Simon Lambert reckons he was the victim of a ‘brainless’ piece of riding when being left with a serious injury for the third successive season. Lambert suffered a badly broken right wrist when involved in a crash with Berwick rider Jye Etheridge at the East of England Arena recently. 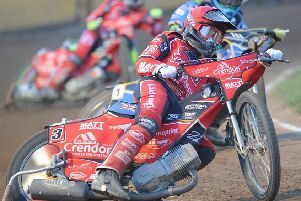 Lambert held second place in heat two of a 54-38 victory against the Bandits on June 11 when clattered by the out-of-control opposition rider. “I just saw a front wheel and a white helmet coming at me,” said Lambert. “I was in front of him by several bike lengths, but he speared me with a brain less move. “He reckons he hit a hole, but I’ve watched footage of the crash and I can’t see where that happens. “Getting injured is always annoying, but even more so when it’s not your fault. Lambert was left with two broken bones which were plated and screwed during an operation last week, when a reconstruction of the joint was also required. He will be in a cast for at least another three weeks but is already eager to return to the saddle. He added: “The operation went well and it’s now just a case of having to be patient, but I’m hoping to be back before the end of July.